To ensure a uniform and consistant mixture of 2 or more part materials, it is essential that the right choice in mixing equipment is made. The SPE Mixing Equipment product range is continually developed and expanded to ensure that contractors are able to achieve constant consistancy and uniformity in mixture of materials. 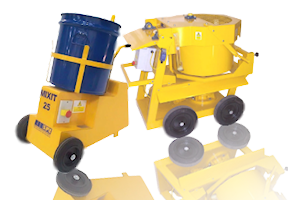 With an extensive range of mixers - ranging from powered hand mixers to larger forced action pan mixers - as well as mixing paddles and screed sledges SPE can provide a complete solution. As with all SPE products, continued development and product review combined with the use of high quality materials ensures maximum performance and extended product life - essential for demanding environments. For the rapid mixing of many products to form a consistant mixture. SPE Powered hand Mixers - ensuring that your materials are combined efficiently and safely with minimum effort. SPE Screed Sledges - maximum consistency in the laying of screed beds. SPE Polyethylene mixer Drums - increase the life of your standard concrete mixer.